The midge is also called the “orange wheat blossom midge” because it is orange in color and it infests wheat at pollination (flowering). It originated in Europe and has been an economic pest in Canada and the northern U.S. The adult wheat midge is about 1/2 the size of a mosquito with an orange body, conspicuous black eyes, three pairs of legs and wings (Fig. 1) The females lay eggs on the awns and heads of wheat plants. 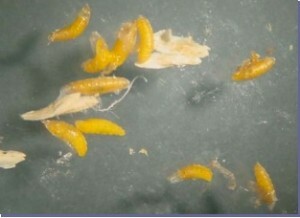 The eggs hatch into larvae and crawl inside the floret to feed on the developing grain. The larvae are about the same size, shape and color as the anthers of the wheat floret (Fig 2). There are no established economic thresholds for midge infestations in Washington State. 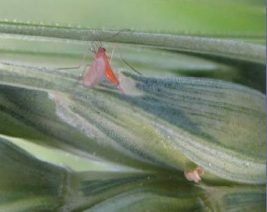 In North Dakota, the thresholds are 1 midge per 5 heads for hard red spring wheat or 1 midge per 7 heads for durum wheat. Wheat Midge – New Wheat Pest?